The entire juice industry has been under the weather for a while. Folks have moved onto other beverages for a few reasons (for instance, we realized we were basically drinking uncarbonated soda). But as everyone around us succumbs to the flu, we apparently turn back to good ol' OJ to make us feel safe. In the wake of America's worst flu season in nearly a decade, orange juice sales spiked last month for the first time in nearly five years. There was an increase of almost a whole percentage point in sales between the end of December and January 20, according to Nielsen data and a report from the Wall Street Journal. For almost a decade the orange juice industry has been suffering because Americans have moved onto to beverages that are (at least marketed as) healthier and less sugary -- not to mention the exciting options available to those who aren't as health-conscious. This situation is so dire that the orange juice market has been halved since 2001. But the most severe flu outbreak in eight years has meant that everyone who's worrying about getting sick is turning to the only place they can think to go -- the sweet and pulpy nectar of the noble orange -- and sales are up for the first time since 2013. Unfortunately there's not much science behind this tradition. Vitamin C can dampen a cold a bit, but, as Grub Street points out, a glass of orange juice has more calories and grams of sugar than a Snickers Bar. You might be better off going directly to the source with something like Emergen-C. 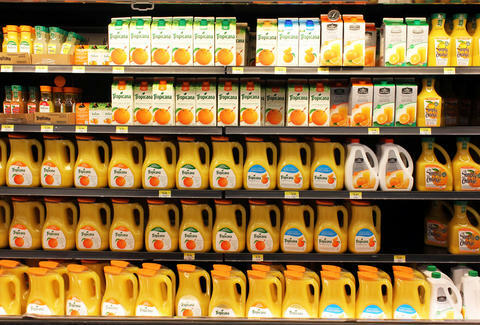 So orange juice may not save us from the flu, but we might end up saving it?